Come as you are, you won't be a stranger long. Norcross Presbyterian Church is a congregation of the Presbyterian Church (U.S.A.). Members of our congregation are different in many ways, but we are all united through our faith in Jesus Christ and our commitment to serving a loving God. If you are new to us, we invite you to visit and explore our worship services, programs, music, drama, and service opportunities. Our various ministries offer something for everyone, no matter where you might find yourself on your spiritual journey. Our worship service is full of life and laughter. Please let us know how we can serve you. 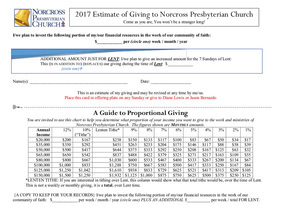 As we prepare for 2017, we ask that you consider your financial commitment to NPC for the coming year. Click on the Pledge Card at left for a PDF you can print out and bring to church on Sunday. Take a look at the church calendar for more events!